In conjunction with the Prophet Muhammad's Birthday holiday, we went to the Ampang Lookout Point to capture some night scene of Kuala Lumpur. It was located 280 metres above sea level and from here we can experience the breath-taking view of Petronas Twin Tower and KL Tower during the night. Initially I planned to make use of my new GPS to navigate to the destination, but it failed and we ended up somewhere near Jalan Ampang instead. We made several enquiries from random strangers, but it seemed like no one really know where the Ampang Lookout Point is. I had a moment of self doubt whether the place actually exist. Later on, we made an emergency called to my friend and got her to 'google-map' up the location for me. The road that lead up to the hill is situated somewhere behind Hospital Ampang. Once we reached the Jalan Hulu Langat, we finally saw the signage the point us towards the destination. The were numerous restaurant from local to international cuisine available here. 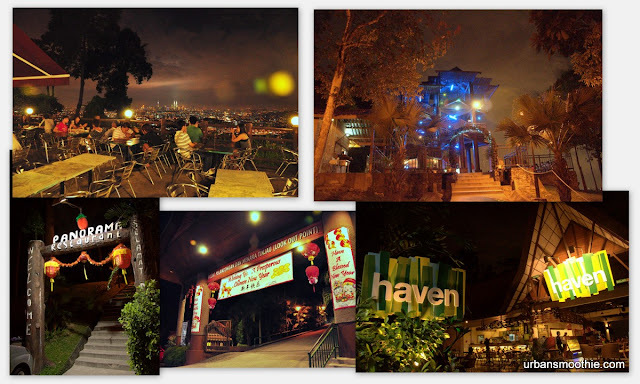 We can enjoy a romantic dinner while overlooking the night scene.